- OPEN: Anyone and everyone may apply to join. - SELECTIVE: Anyone and everyone may apply to join, however some Wings are invitation only. - INVITATION ONLY: Recruitment is invitation only. - TENTATIVE: Anyone and everyone may submit a membership application, however we cannot guarantee processing. - CLOSED: Recruitment is closed. How to join Xiphos eSports? 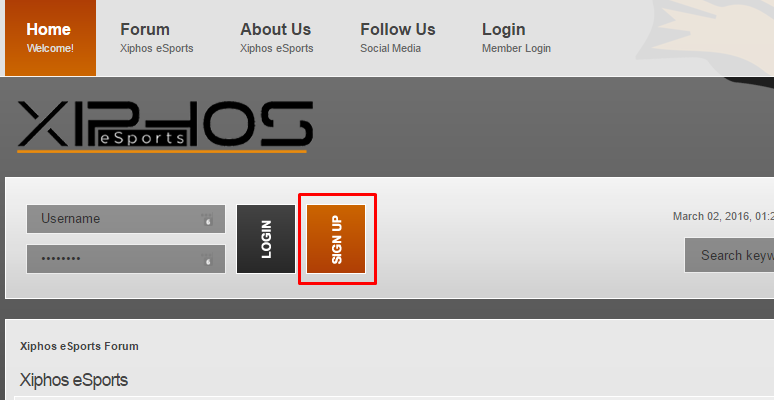 To join Xiphos eSports, you need to first be a registered member of the forum. You can do this by clicking the Sign Up button. Once you have a forum membership, you need to create a new thread (topic) in the Recruitment board. The application should contain the information for the following details. You may copy and paste it from below. Please answer honestly as this will help us process your application smoothly. Fake/incorrect information on the application can be grounds for rejecting an application. What is the Recruitment Process at XIphos? Every application will take a minimum of 2 weeks to be processed, unless it's a well-known player who is needed for an emergency tournament, or a special invitation of sorts. Every recruitment application can be vouched upon by existing members in the clan. This helps identify and find out who an applicant is. An application having vouches by existing clan members of the wing (division) of the applicant's primary game (ex: a new COD4 recruit getting 3 vouches from 3 existing Xiphos COD4 players, on his application) will help his/her application's validity. However any amount of vouches alone will not suffice to be recruited. Every application will first be evaluated by the Wing Leader. The Wing Leader will determine the playing skill of the applicant and what category or level of play suits him/her the best. Each application will thereafter be analysed by the Recruitment Managers. This to determine if the applicant's values and standards are suitable to the ethics and standards set by Xiphos eSports. The Recruitment Managers may use any publicly available knowledge about the applicant and/or other means to determine this. After both the Wing Leader and Recruitment Manager have provided positive feedback on the application, a Clan Administrator will thereafter verify all details and provide the final approval and post the Welcome message for the application. - does not get enough vouches (recommendations) but gets positive feedback by the Wing Leader and/or Recruitment Manager after his evaluation. - is of an applicant who is not well-known in the community and cannot be personally vouched for by any Wing Leader, Staff or Recruitment Manager. - is of an applicant who is known to switch clans on a regular basis. *This will not affect players that are invited to a team, as long as the Team Captain and Wing Leader can both personally vouch for the player. **An Apprentice has limited entitlements within the clan. Receiving a vouch is considered an endorsement by an existing Clan Member on the applicant's suitability to join the clan. Getting to know existing clan members is key to receiving the sufficient number of vouches. It is also important to stay active on the forums after posting your application. Please be informed that the possibility for the applicant to participate in LAN sessions, outings, etc is encouraged and will provide an advantage for the applicant to be accepted. Any reasons for not being able to participate in LAN sessions, etc (ex: Parents, Living too far, etc) need to be honestly mentioned in the application. Here at Xiphos we take our gaming seriously but at the same time value the spirit of brotherhood and loyalty towards each other. This is where we stand out from other clans. In general, we expect every clan member to be of service to the clan by either playing competitive LAN or online tournaments representing Xiphos or be present for meetups, LAN sessions, tournaments, etc to cheer and motivate our teams and players. Put in simple terms, we need people who would embrace and fit in well with what Xiphos has best to offer, the Brotherhood! How will I know that I am accepted to Xiphos? The outcome of the application will be announced on the forum topic and applicants should not continue to spam or canvass the forums for vouches (eg: pls giff vouches), etc. 1. You are a confirmed and formal member of another clan. 2. You take too long to respond. After you have posted your application, you will need to respond to all application-related queries asked by clan members within 10 days or your application will be rejected. 3. You have a criminal record and/or have been involved in casual yet criminal activities, deemed criminal under Sri Lankan law. 4. If you have applied before and your application was cancelled 2 times or rejected previously for any (but not limited to) the reasons given above. 5. You have lied in any of the details provided on your application. All Xiphos eSports Members are bound by our Global Membership Agreement. Please read it at your leisure and if you are not willing to abide by any single clause on it, save us all the trouble and avoid applying for membership! Announcements / Xiphos eSports turns 10! Follow us, like us and keep in touch! Follow Xiphos eSports on the following social networks. Xiphos eSports have Community Groups on the following gaming networks. All editorial content and graphics on our sites are protected by international copyright, international treaties, and other applicable copyright laws and may not be copied without the express permission of Xiphos eSports, which reserves all rights. Reuse of any of Xiphos eSports editorial content and graphics for any purpose without Xiphos eSports' permission is strictly prohibited. Permission to use Xiphos eSports content is granted on a case-by-case basis. Xiphos eSports welcomes requests. DO NOT copy or adapt the HTML or other code that Xiphos eSports creates to generate pages. It also is covered by Xiphos eSports' copyright. As a regular part of our business, Xiphos eSports displays advertisements and product listings from a wide variety of companies. Xiphos eSports is not in a position to arbitrate disputes between the owners of intellectual property rights and companies who advertise or list their products on our sites. 8. Your electronic or physical signature. If your materials have been removed based on the complaints of another party Xiphos eSports will provide you with notice if your materials are removed due to alleged infringement of a third party's intellectual property rights. We will also provide you with the e-mail address of the complaining party so that you may attempt to resolve the issue. We will restore your materials upon notification from the complaining party that the dispute has been resolved. If you believe your copyright material is being used on this Web site without permission, please contact us at [email protected]! We may modify this Notice at any time without notice to you by posting the revised edition on our sites. Your membership to Xiphos eSports (this "Membership") is offered on the grounds that you agree to this Global Member Agreement (this "Agreement"). Xiphos eSports ("us") may modify this Agreement at any time without notice to you, by posting the revised Agreement on our sites. Your acceptance of Xiphos eSports's offer of Membership and use of its sites constitutes your binding acceptance of this Agreement, including any modifications that Xiphos eSports makes. You must be at least 13 years old to register for Membership. Xiphos eSports does not knowingly collect any information from any users under 13 years of age, and if it is found that an underage user has fraudulently registered, their membership will immediately be terminated. You agree that Xiphos eSports will not be liable to you or any third party for taking any of these actions. You understand and agree that Membership may include communications such as announcements and administrative messages from us and that these communications are considered part of the Membership. You may opt out of receiving these messages, however we are not liable or responsible for any actions that you take or do not take due to you having opted out of the above mentioned communications. You also understand that Membership may or may not include advertisements. Use of our sites is subject to existing laws and legal process. Nothing contained in this Agreement shall limit Xiphos eSports' right to comply with governmental, court, and law-enforcement requests or requirements relating to your membership within Xiphos eSports. If Xiphos eSports requests registration and communication information from you, you will provide Xiphos eSports with true, accurate, current, and complete information. You will promptly update such information to keep it accurate, current, and complete. If Xiphos eSports issues you a password, you may not reveal it to anyone else. You may not use anyone else's password. You are responsible for maintaining the confidentiality of your accounts and passwords. You agree to immediately notify Xiphos eSports of any unauthorized use of your passwords or accounts or any other breach of security. You also agree to exit from your accounts at the end of each session. We will not be responsible for any loss or damage that may result if you fail to comply with these requirements. You agree to use Xiphos eSports' bulletin board services, chat areas, news groups, forums, communities and/or message or communication facilities (collectively, the "Forums") only to send and receive messages and material that are proper and related to that particular Forum. If you choose a username that, in Xiphos eSports' sole discretion, is obscene, indecent, abusive or that might otherwise subject us to public disparagement or scorn, Xiphos eSports reserves the right, without prior notice to you, to automatically change your username, delete your posts from our sites, deny you access to our sites, or any combination of these options as seen fit by Xiphos eSports. You agree not to expose, publicize, divulge, grant unauthorised access to, sell, discuss externally, exchange and/or trade (collectively "mishandling") all threads and data that has been posted in or moved to a category with the "Members Only - " prefix. Xiphos eSports reserves the right, with prior notice, to demote you from your current rank, place and/or terminate your Membership as seen fit by Xiphos eSports, if and when the above mentioned threads and data has, by your fault, been mishandled. You agree not to copy, modify, rent, lease, loan, sell, assign, distribute, reverse engineer, grant a security interest in, or otherwise transfer any right to the technology or software underlying Xiphos eSports' sites or the Services. You agree not to modify the software underlying our sites in any manner or form or to use modified versions of such software, including (without limitation) for the purpose of obtaining unauthorized access to our sites. Unauthorized access to Xiphos eSports property is a breach of this Agreement and a violation of the law. You agree not to access Xiphos eSports property by any means other than through the interface that is provided by Xiphos eSports for use in accessing Xiphos eSports property. You agree not to use any automated means, including, without limitation, agents, robots, scripts, or spiders, to access, monitor, or copy any property of Xiphos eSports, except those automated means that we have approved in advance and in writing. Within a multiplayer environment, game or competition, cheating of any kind (including by exploiting any bug or error) is expressly prohibited, this includes exploiting any deficiency in code or design, or in the code or design of any third party product or service used in connection with Xiphos eSports, to gain an unfair advantage or to gain unearned or unauthorized privileges, access or abilities not clearly intended by the product's design. Xiphos eSports reserves the right, with prior notice, to demote offenders from their current rank, place and/or terminate their Membership as seen fit by us. Xiphos eSports will also actively support and/or contribute to exposing offenders. Xiphos eSports will also actively support and/or contribute to disciplinary action taken against offenders, such as banning the offender from game servers. Communicating supportive and/or contributive information about such activities to others will also be considered cheating and/or exploitation. Xiphos eSports reserves the right, at its own expense, to assume the exclusive defense and control of any matter for which you are required to indemnify us, and you agree to cooperate with our defense of these claims. Xiphos eSports may be required by state or federal law to notify you of certain events. You hereby acknowledge and consent that such notices will be effective upon Xiphos eSports posting them on its sites or delivering them to you through e-mail. You may update your e-mail address by visiting the Services where you have provided contact information. If you do not provide Xiphos eSports with accurate information, Xiphos eSports cannot be held liable if we fail to notify you. Xiphos eSports' failure to exercise or enforce any right or provision of this Agreement shall not constitute a waiver of such right or provision. You agree that regardless of any statute or law to the contrary, any claim or cause of action arising out of or related to use of our sites or this Agreement must be filed within one (1) year after such claim or cause of action arose or be forever barred. This Agreement, including all terms, conditions, and policies that are incorporated into these terms by reference, constitute the entire agreement between you and Xiphos eSports and govern your membership within Xiphos eSports, superceding any prior agreements that you may have with us. This Agreement shall be construed in accordance with the laws of the Democratic Socialist Republic of Sri Lanka, and the parties irrevocably consent to bring any action to enforce this Agreement before an arbitration panel or before a court of competent jurisdiction in the Democratic Socialist Republic of Sri Lanka if seeking interim or preliminary relief or enforcement of an arbitration award. If any part of this Agreement is determined to be invalid or unenforceable pursuant to applicable law, then the invalid or unenforceable provision will be deemed superceded by a valid, enforceable provision that most closely matches the intent of the original provision, and the remainder of the Agreement shall continue in effect. Xiphos eSports may modify this Agreement at any time without notice to you by posting the revised Agreement on Xiphos eSports sites.